Hah! I knew she wouldn’t notice. She’s always so busy with that tiny dog of hers. When they went out for a walk this morning, I took my chance. I nicked the camera, went to Catanzaro, and I found exactly what I was looking for. As a young cub, I remember curling up next to my father asking to hear The Story. When my father was much younger, he was beautiful, but he had always been in the shadow of his older brother, who was one of the best hunters anyone could remember. One day as my father was roaming around the Kalahari hoping to stumble across a just-killed antelope to share with the pride, he came across a strange-looking creature playing in the sand. My father remembered his father telling him about such things–men–and that they would only harm us if we weren’t nice to them. So my father asked him a question. The man turned to my father, and his eyes quickly swelled with tears. He was quite thin with long hair and beard and his pale legs shook as he stumbled to his feet and stood before the lion at least twice his size. He gripped my father’s head between his hands, smoothed some sand from his mane, and kissed my father’s wet nose. And so my father, who had not yet met my mother, left his pride for Italy, traveling with Leonardo for many years before returning to the Kalahari. My father’s face became a part of many of Italy’s most famous buildings, as well as some that aren’t so famous. So imagine my delight when Sognatrice chose me to be her lion in the Shameless Lions Writing Circle. I was going back to Italy! I could finally see my father’s doors! And this morning I had my chance. For anyone who hasn’t been to the old part of Catanzaro, let me tell you, it’s confusing, and no one seems to know the names of the streets when you ask them. I wandered in and out of the tiny alleys for hours before I came to a little square, the exact place my father had once described to me. And there he was. My father’s gorgeous eyes staring back at me after all these years. Isn’t he beautiful? Can you see the resemblance? My father so loved this artist and was so grateful for all of the good things he brought to him that when I was born, he named me Leonardo to honor him. And now here I am back at home with Sognatrice. I tried to sneak the camera back to its spot, but of course my whole secretive plot was foiled when I realized that I needed her fingers to type this. She’s a good lion caretaker, though. She didn’t yell or anything. Turns out she’s a sucker for a good story. Your creativity astounds me sometimes, you know that? Very fun story. Leonardo has a way with words. Ally, well you know ever since he joined this Writing Circle, he’s really opened up. Paolo, curses! I just knew the LOL cats were behind this! Yeah how’d you get so creatively cleaver? I’m slow, I had to read it twice and had missed the other post so I’m catching up. *oh sheesh! you know I meant clever, LOL . . . but cleaver now that’s interesting. How wonderful that you finally got a chance to see your father’s doors! And it’s even more wonderful that you have Sognatrice as your caretaker, as she seems very kind and caring. Please come back and tell us more stories when you can! I, too, have missed a bunch of posts, with my hectic last few days. Time to pull up a chair in the nice little courtyard of our hostel, which also surprisingly has wireless. Very cool post, Leonardo! I love your story! Thanks Shan and Jenn! Since the positive feedback from this post, Leo has been talking up a storm…. 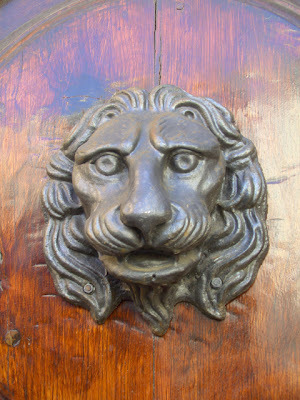 I’m not sure I’d want my head (real or likeness up on a door) but then I’m not a lion. I’m tagging you for a meme. I hope you don’t mind. * Don’t forget to leave them a comment telling them they’re tagged, and to read your blog. Great writing! Your creativity inspires me. You are like an artist who uses words on paper instead of paint on canvas. Viaggiatore and I LOVED this, it’s wonderful! What a great story!!! Leonardo, I hope you will share many more stories with us, and photos… as it seems you are as good a photographer as our dear Sognatrice, my PSOK. Scarlett and V, I’m so happy you enjoyed my tail, er, tale. I still have to talk about how I got this heart on my sleeve though; that’ll be more difficult to write….